Surreal comedy. Could there possibly be a better term to describe and define The Firesign Theatre? They produced more than a dozen albums for Columbia Records, including "Don't Crush That Dwarf, Hand Me the Pliers" and "I Think We're All Bozos on This Bus." They created indelible characters such as 'Nick Danger, Third Eye' (Phil Austin) and George Tirebiter (named after the original USC mascot). The creativity of Peter Bergman, Philip Proctor, Phil Austin and David Ossman, knew no bounds. Their fans are legion, and their irreverence unmatched. Proctor and Austin continue to shine bright lights on the absurd while remaining purveyors of insight into the preposterous aspects of life in the 21st century. - A short performance from the 15th Anniversary Tour in April, 1981. 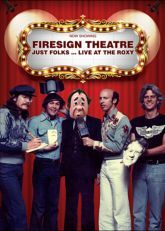 Sit back, close your eyes and open your mind to the absurdist surrealism and satire of the Firesign Theatre, LIVE.